Cyberspace has become an important battlefield, and an integral part of current and future conflicts. Recent years have seen increasing cyber-attacks on political targets, crucial infrastructure, and the Web sites of commercial corporations. These attacks, which are also, increasingly, receiving international attention, are perpetrated by nation-state actors (which do not take responsibility for them); groups of hackers (such as Anonymous); criminal organizations; and lone hackers. Nation-state actors are becoming ever more aware of the cyber threat, and are assessing its effect on their national security. To this end, many of them are finding (and funding) ways to develop the defense mechanisms to cope with the threat, as well as their own offensive capabilities. Terrorist organizations are also a part of this dynamic, mutable environment. During the past two years, global jihad groups have also been honing their ability to act in cyberspace. 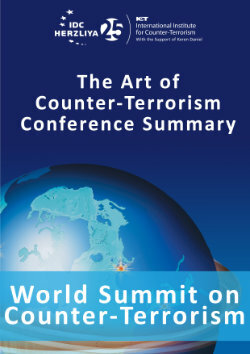 They are extending their activities from “typical” use of the Internet for communication, recruitment of operatives, fundraising, propagandizing, incitement to hatred and violence, intelligence gathering, and psychological warfare, to attacks on the enemy’s critical infrastructure cyber warfare techiniques. Increasingly, terrorist organizations are integrating the information available to them from the virtual world with that available to them in the real world, and using the former to develop offensive capabilities in the latter. This they call “electronic jihad”. Given these developments, and as part our belief that “sharing information increases our ability to confront terrorism”, the International Institute for Counter-Terrorism (ICT) of the Interdisciplinary Center (IDC), Herzliya has decided to disseminate a periodic report and analysis of information gathered by our cyber-terrorism desk. A bi-monthly report of the Jihadi Website Monitoring Group (JWMG), which summarizes and analyzes jihadist discourse on Web sites and forums, blogs and chat rooms. A monthly database report summarizing and analyzing terrorism-related events worldwide. This and forthcoming cyber-desk newsletters will address two main subjects: cyber-terrorism (offensive, defensive, and the media, and the main topics of jihadist discourse); and cyber-crime, whenever and wherever it is linked to jihad (funding, methods of attack). We welcome brief articles from scholars and researchers engaged in the study of cyber-terrorism, cyber-crime, and electronic jihad. Interested researchers may submit articles for publication to [email protected] Articles will be peer reviewed. Those accepted for publication will be published under their author’s name.